Point guard Rodrigo Gallegos (PG) put on an extraordinary performance in the last round for Deportivo Norte, receiving a Interperformances La Liga Argentina Player of the Week award for round 3. The player recorded a triple-double of 22 points adding also 10 rebounds and 13 assists, while his team beat Sportivo America (#5, 2-2) 93-83. Deportivo Norte maintains the 4th position in their group in Argentinian La Liga Argentina. Deportivo Norte is a typical solid league team placed somewhere in the middle or a little bit lower in the standings. They need more victories to improve their 3-4 record. In the team's last game Gallegos had a remarkable 57.1% from 2-point range. He has many years of experience at Deportivo Norte, through which he has constantly improved. Rodrigo Gallegos has solid league stats. He is league's best passer with 9.1apg. Gallegos is in league's top in and averages impressive 61.3% FGP. 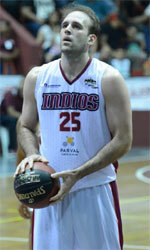 The second best player in last round's games was 27-year old Joaquin Gamazo (198-PF-91) of Atenas Carmen. Gamazo had a very good evening with a double-double of 25 points and 11 rebounds. Bad luck as Atenas Carmen lost that game 88-102 to Petrolero (2-3). The season is still at the very beginning and this lost game may not be such crucial, of course if they start win the games. Let's wait for the next round. Gamazo is a newcomer at Atenas Carmen, but is already one of team's top players. Third on the list of top players last round was American forward Corbin Jackson (198-F-92) of CICLISTA (#4). Jackson scored 21 points and grabbed seventeen rebounds (!!!). Despite Jackson's great performance Ciclista lost 67-82 to #2 ranked Rocamora. But his team cannot count on just a single player as he also needs help of the other teammates especially in such crucial game. The last thing Ciclista needs is to lose another game like this one. They lose more and more distance to the top teams in South - C.South. Their record is 3 victories and 2 lost games. Jackson has a great season in Argentina. After only 5 games, he made it on the list of the league's leaders in points with 20.6ppg (3rd best) and rebounds with 12.2rpg (#1 in league). Jackson attended one of camps at Eurobasket Summer League on his way to pro basketball.